“Blaine rolled his pump truck and it doesn’t look good,” said the voice on the phone. The next call confirmed Wendy-Ellen Nittel’s worst fears: her son Blaine had died at the scene. Wendy-Ellen now wears Blaine’s high school graduation ring to keep him close. It’s always on her hand when Wendy-Ellen tells Threads of Life’s story at exhibitions and trade shows, and her own story at Speakers Bureau events. Blaine intended to be the fourth generation working the family farm in Alberta. He and his father Bruce would often talk about their plans for the future. Instead, the young man died in a single vehicle collision while driving a pump truck to a well site near Manyberries, Alberta. Wendy-Ellen also honours Blaine as a Threads of Life’s Speakers Bureau member, and a Threads of Life representative at trade shows and exhibitions. She has also joined the Threads of Life board of directors, to be a representative for family members in guiding the organization. 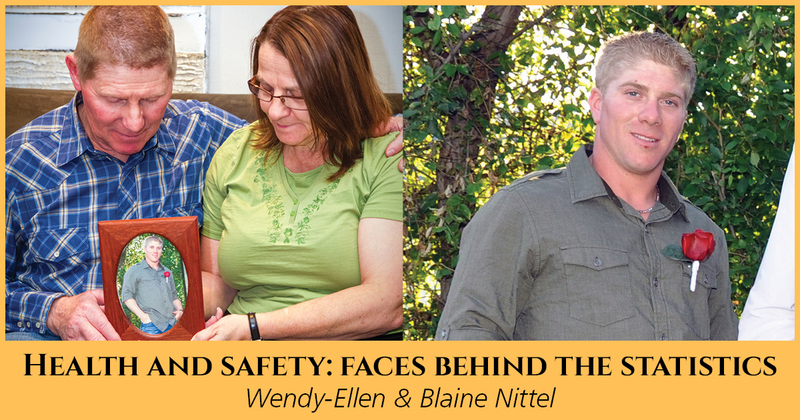 Read more about Wendy-Ellen’s story on page 4 of the Summer 2014 newsletter.